Lazada upgrades online shopping anew with the launch of the LazMall, featuring almost a thousand authentic brands with over 70 million product listings. LazMall is touted as Southeast Asia’s biggest mall that aims to provide shoppers across the region, including the Philippines, with reliable services and product quality assurance. Online brands as well as authorized brand distributors of products from Apple, Samsung, Xiaomi, JBL, Philipps, Mac, L’Oreal, Dove, Olay, Levi’s and many more will be made available in Lazada LazMall. This was the result of customer feedback analysis and a combination of a wide selection of trusted brand names for a better customer experience. It is also worthy to note that Samsung, the world leader in technology and innovation, joins Lazada’s upcoming Sale tomorrow September 9 (tomorrow). As a long-time partner of the leading e-commerce website, the tech giant offers special bundles and discounts for consumers who purchase select Samsung products. Primarily, LazMall shopping guarantees 100% authentic products as it will only sell original branded products. If shoppers receive non-authentic products, Lazada promises to give shoppers twice their money back with their 15-day hassle-free return policy. It states that shoppers can change their minds within 15 days of purchase if they are not completely satisfied with their purchase from LazMall at no cost. Moreover, there’s an offer of “next day delivery“. For items Fulfilled By Lazada (FBL), LazMall promises next-day delivery within Metro Manila. With this, shoppers can look forward to receiving their purchases within 24 hours! 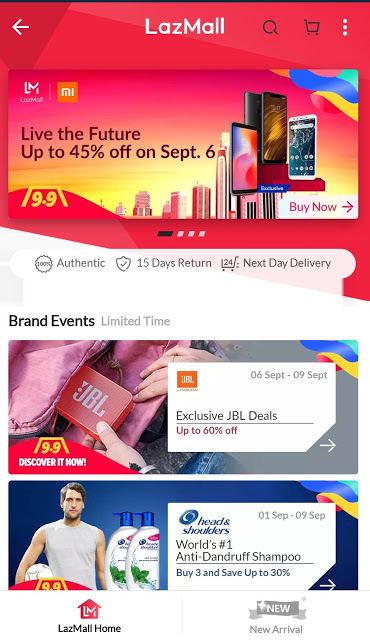 LazMall will be launched with a 9.9 Sale this upcoming September 9, 2018, making it the perfect way to ease shoppers into their year-end shopping sprees. The Lazada 9.9 Sale spans six countries – Indonesia, Malaysia, Philippines, Singapore, Thailand and Vietnam. “Lazada cements its position in the industry by continuously innovating and redefining the shopping experience for shoppers and brands. LazMall is the new way to shop and we are very excited to transform e-commerce into the preferred shopping and selling option of every Filipino,” said Ray Alimurung, Lazada Philippines’ Chief Executive Officer. Moreover, shoppers can revel in greater discounts up to 90% and bargains for their early Christmas shopping or personal indulgences. To make shopping more fun, shoppers can snag vouchers and great offers with the “Slash It” and “Shake It” games through the Lazada App. Now, indeed, customers have “All They Ever Wanted,” the official theme of Lazada LazMall!